We've gotten word from Motorola that they've teamed up with Nextel and Symbol Technologies to make the first wireless barcode scanner for mobile phones. This looks to have a real use in warehouse environments and even in certain retail applications. 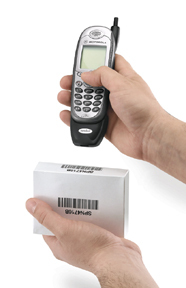 The Symbol PSM20i allows real-time collection of data that's transferable via Nextel's network. It costs $249 and is available now but you have to have a Motorola i85s, i55sr, or i50sx iDEN phone for it to attach to.